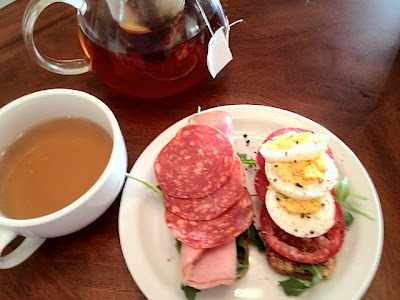 Just because you have decide to take care of your health and give up grains does not mean you also have to give up sandwiches. 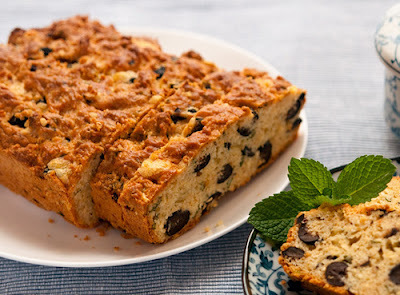 Mark Sisson has declared Paleo bread to be Primal (read his post here), so as long as you eat it in moderation you can still indulge. 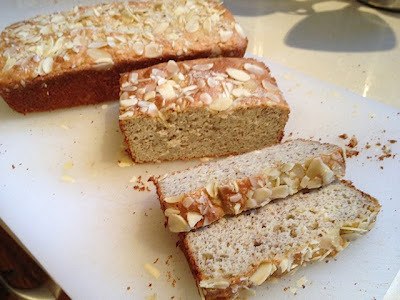 ..... and this almond bread which is terrific just by itself. 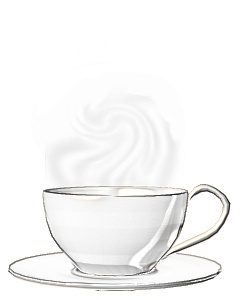 It tastes sweet but has very, very little sweetener. 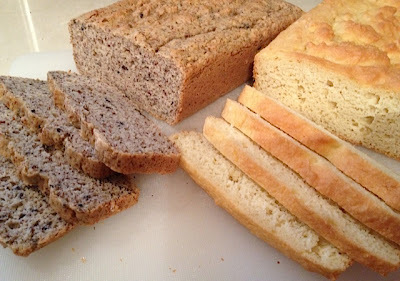 But today I want to concentrate on my basic bread recipe (see top photo for both the white bread and olive version) and here is my updated version that I use for sandwiches. Remember that if you are having problems finding any of the ingredients locally, you can always order them online. - Add eggs and coconut oil and pulse again until combined. - Remove from oven and cool completely on a rack before slicing, otherwise it will crumble. I find leaving it overnight is the best. Variation : If you like the taste of olives, you can add 1/2 a cup of black olives and process it with your batter. I also use olive oil instead of coconut oil or butter when I do this, and I find this gives a great flavoured bread to use with savoury sandwiches. The nice thing about my basic recipe is that the bread can be sliced very thin. As long as you let it cool completely before slicing you can get 20 to 25 quarter inch slices out of a regular sized loaf. These are not the size of a supermarket loaf of bread, but will still make very nice sandwiches. 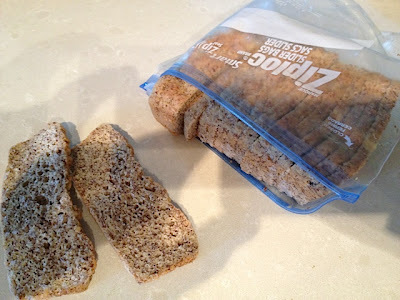 I keep mine in a ziplock bag in the freezer and then just toast them when needed. Mark Sisson says not to eat Paleo bread every day, but with my recipe, especially since I slice it so thinly, I don't see why you can't indulge in a couple of slices a day. A 24 slice loaf gives you only one tablespoon of ground nuts per slice. 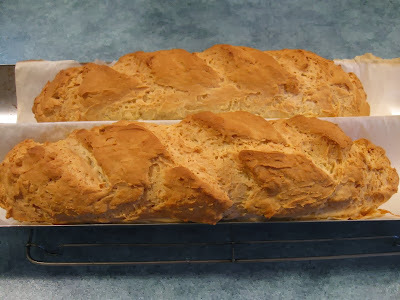 Since this bread is made with lots of eggs as well as nut flour it is much more filling than regular bread. I'm sure you will find like I do that slicing it thin works very well and is very satisfying. As long as you never have more than a couple of slices, and make it a rule not to have any other nuts on the day that you have nut bread, you're not overdoing it. 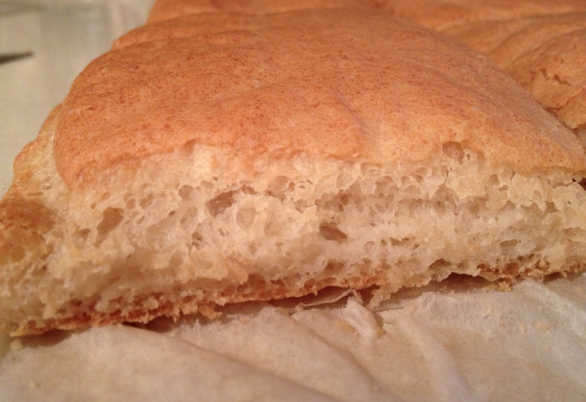 ....or my Ciabatta buns recipe. Both of these are remarkably like the real thing and will give you even more menu options. 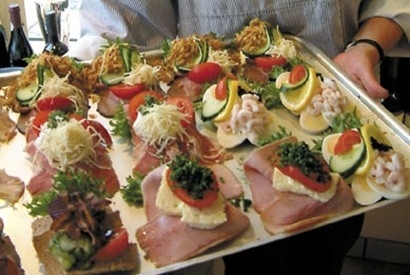 My favourite sandwiches are the kind that are very popular in Scandinavian countries - open faced. This is a great way to make sure the bread just has a supporting role in your meal rather than being the star of it. 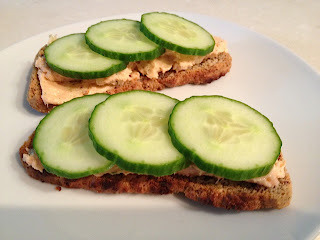 One of my absolute favourite sandwiches is my salmon mousse with sliced cucumber. This allows me to enjoy all the health benefits of seafood as well as the health benefits of gelatine - a double win. Other favourites include Egg and tomato and ham and salami. As you can see the bread plays a very minimal role, and I think that's the way it should be. It's the filling that needs to shine. 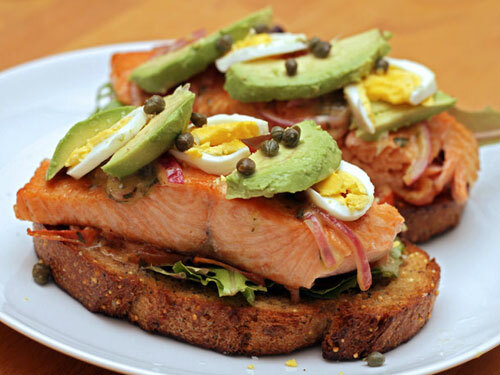 There are many wonderful open-faced sandwiches that you can make. You are limited only by your imagination. Here are a few more examples I found. As you can see any kind of meat, seafood or chicken will work very well. 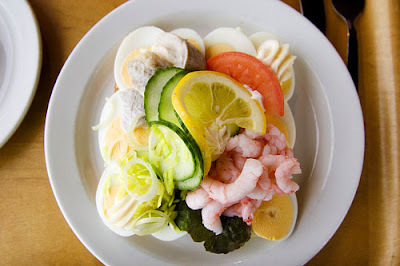 In this sandwich from Iceland you can't even see the bread for all of the toppings - which personally I think is ideal. 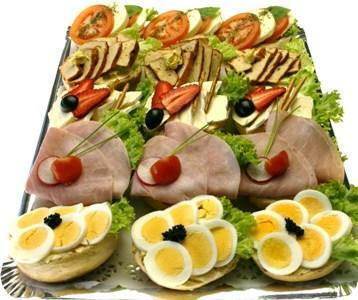 And open faced sandwiches look wonderful as well as taste great so they are the perfect thing to serve at an impromptu summer party. You can even have a sandwich for dinner like this one make with a salmon fillet and topped with egg, avocado and capers. 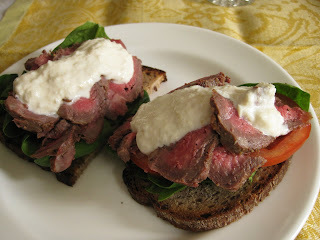 This Danish open faced roast beef and tomato sandwich would be very filling as well. Horseradish sauce helps bring out the flavour. For transporting to work the best thing is to take your fillings and your bread separately and to make the sandwiches just before you want to eat them. That way they will be fresh not soggy. 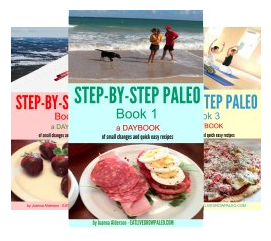 Whether you eat your sandwiches at home or at work, and whether you eat them yourself or choose to serve them at a party, never feel that because you are now a Paleo eater you have to do without. 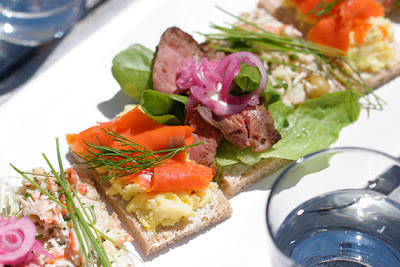 This delicious "Smørrebrød" is a great example of a great dining experience. Can i substitute egg whites for a few eggs mentioned above? You could do ... but why would you want to? I was wondering, this is my first time trying to bake paleo bread and I followed your recipe to a "t". The batter was extremely crumbly and then just fell apart after baking. Please help! Buying is to expensive and want to rely on myself. Thank you for your time. Hi Eric. The thing to watch out for in baking with coconut flour is that it absorbs a lot of liquid. It sounds like your batter was too dry. Next time you try baking bread make sure you are using large eggs, but if it still seems very dry you can add an extra egg or even some water. You want to end up with a batter that is the consistency of a quick bread batter. The batter should definitely NOT be crumbly. I'm going to try this in the next few days! They look amazing and very healthy. Do you know what the vinegar is for in this recipe? Is it meant to react with something else in the bread? The original recipe contained apple cider vinegar along with honey - both very good for you, but it seems to me they cancel each other out. I like to keep my recipes simple with as few ingredients as I can get away with, so now I don't use either of these and I've found the bread still turns out great. can i ask, what do you mean in your above comment when you say the honey and apple cider vinegar "cancel each other out"? 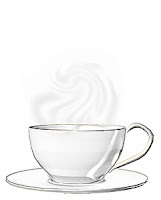 The way I see it, the honey adds a sweetness that really isn't necessary, and the vinegar takes away that sweetness. Why not just take out these ingredients that don't add anything and make the recipe simpler? This is just a personal preference though. Some might like to add both for the health value. Vinegar doesn't "take away sweetness", it adds sharpness. They don't "cancel each other out", they BALANCE each other out. Honey and vinegar together will help the bread to rise when there is no yeast. I found your site awhile ago and I'm in the middle of making this bread for the second time. The first time my hubby was overseas and so tonight he gets to have grilled cheese again! It's, by far, the best recipe for paleo bread that I've found. It holds together nicely and slices well. Thanks so much!